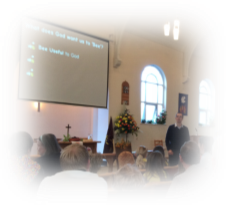 We offer opportunities to worship at 10 am and 6.30 pm every Sunday. Every one or two months in the evening a Praise Service is held. On the fourth Wednesday of every month there is a service at 7.30 pm called Sanctuary. This is an alternative and usually reflective act of worship that is led by aspiring worship leaders and local preachers from the Church. We celebrate Holy Communion in the morning on the second Sunday of every month and there is also Holy Communion in the evening on the first Sunday of each month.